PopMatters Comic Book Review -- Jeremy Estes and Neil Kenyon review Grant Morrison and Frank Quitely's new take on DC's most iconic character. If one accepts John Lennon's assertion that "before Elvis, there was nothing," then think of this  Superman is the Elvis Presley of comics. Sure, there were prototypical heroes before Action Comics #1 hit newsstands in 1938  the Spider, the Shadow  but Superman was the first super man, able to leap tall buildings and all of that. Like Elvis, Superman came from humble beginnings  orphaned by his Kryptonian parents, adopted by the Kents and raised good ol' Smallville, USA, the former Kal-El grew up to be not only the world's greatest hero, but a successful (if clumsy) newspaper reporter to boot. Both would invite countless imitators and inspire nearly everything that came after them. Like the saying goes, "before anyone did anything, Elvis (Superman) did everything." The trouble is, Superman is also like later period Elvis, Vegas Elvis, bloated and out of control. Real world and comic book world events  September 11, Watchmen, The Dark Knight Returns  have caused Superman's relevance to come into question time and again. He's not the only hero who's suffered in this post-everything world, but he's suffered the most because he was the first and he's the simplest. DC learned this as long ago as the Silver Age when Marvel began treating their heroes like real people, giving Spider-man money troubles and allergies and the Thing a complex about his looks. Readers also found Superman a little less thrilling because, after all, it's hard to complain when you can fly and nothing can hurt you. Over the past 20 years or so, the Big Two comic companies have relied on character revamps to give their sagging flagship characters a jolt of the modern and introduce them to a new generation of fans. Think of it as the comic industry's version of the '68 comeback  a familiar character stripped down to its core and thrust into the limelight once again after years of mediocrity. It's been done with Superman before  writer-artist John Byrne took on Supes in his Man of Steel mini-series in 1986, and again in 1993 during the "Death of Superman" storyline. While these revamps are often touchy issues with fans  -anyone remember the Spider-clone debacle?  they are in many ways necessary to keep a character going. Then again, enough is enough. What comics creators should learn is that sometimes a character should always be stripped down because otherwise it's not the character. This is the case with Superman. The notion of the Man of Tomorrow gets tired because Tomorrow was yesterday. Superman can't be the Man of Next Week and no one should pretend he is. Unless you're Grant Morrison. Morrison is no stranger to the revamp himself, taking the second tier super team the Doom Patrol out of the cellar and creating a weird and edgy super hero comic for DC in the late 1980s. By setting his Superman story in the All Star universe  DC's answer to Marvel's Ultimate line  Morrison has the freedom to not worry about fussy continuity or what villain of the month his hero has to face. Here, Lex Luthor is determined to kill his nemesis, Lois Lane is a freethinking reporter and Superman is the answer to everyone's problem. That is, until he starts to die. And no, don't be afraid  even after reading this single issue of Morrison's planned 12-issue series one can tell there is no mulleted Superman in DC's future like the last time he died. This time, after saving a crew of scientists from a sabotaged space flight to the sun, Superman's cells  powerful receptacles of solar energy  are overloaded, resulting in new powers and rapid cell degeneration. He gets the bad news from Quintum, a kind of Willy Wonka scientist in a prismatic overcoat. But this is a comic book, so there's hope  Quintum has been planning for just such an occasion by working to create a new race of super humans in the event of Superman's death. If Superman cannot be saved, at least he can be replaced. Keeping this information quiet is Superman's top priority  nothing emboldens super villains like a sign of weakness. Instead, Superman goes about his regular routine, saving children from traffic and leading a double life as Clark Kent. Morrison plays with his hero's mortality by asking, "what would you do if you knew you were going to die?" This is a lot to ask of Superman, of course  even with the character stripped down it's hard to imagine what's missing in the life of a man who can fly to the sun. Instead of jumping from an airplane or climbing a mountain like a normal person, Morrison has Superman break the number one rule of super heroing  reveal his secret identity to, you guessed it, Lois Lane. Of course this has been done in the "real" DC universe already, but it's an essential part of the Superman mythos. That Morrison gets it out of the way in the first issue indicates there might actually be something new here, a new story worth telling. If this revelation had been saved for the end it would have been anticlimactic and hokey. 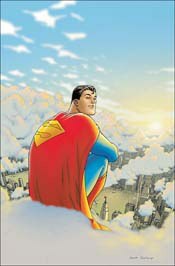 Quitely's rendering of Superman recalls that of Tim Sale's from the 1998 series Superman for All Seasons  he's bulky and square-jawed, evoking the classic hero known around the world but still looking fresh and modern. Still, there is the feeling this has been done before, that this is just rehashing old material rather than taking the character somewhere new. Morrison and Quitely have set up a promising tale, but only time will tell if they take the last train to Memphis or head West, all the way to Vegas.